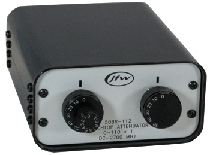 The 50BR-112, the bench-top rotary attenuator from JFW Industries, adjusts from 0-110dB in 1-dB increments and it operates from DC to 2700 MHz. The 50BR-112, the bench-top rotary attenuator from JFW Industries, adjusts from 0-110dB in 1-dB increments and it operates from DC to 2700 MHz. It's capable of handling 2 Watts RF input power and maintains a VSWR of 1.8:1 maximum (1.6:1 typical). It's compact size conserves bench space and makes testing a snap from IF to RF and everything in between. The 50BR-112 is comes with BNC, SMA, N, or TNC Female connectors and other configurations are also available.